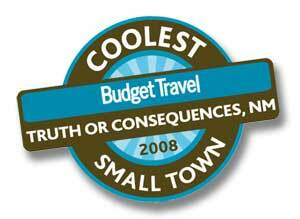 City of Truth or Consequences New Mexico: Hot Springs, Cool Town! 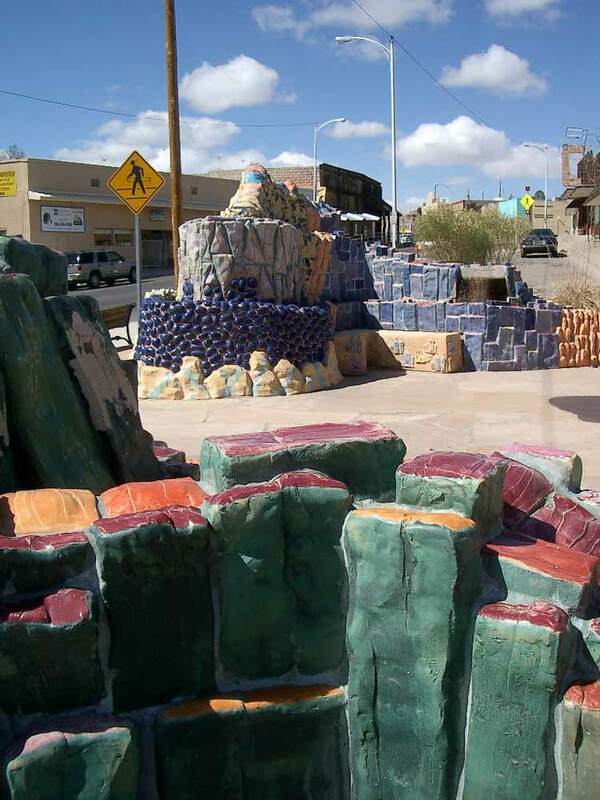 Once known as Hot Springs, Truth or Consequences New Mexico is a small resort town with a year-round population of slightly more than 6,000. 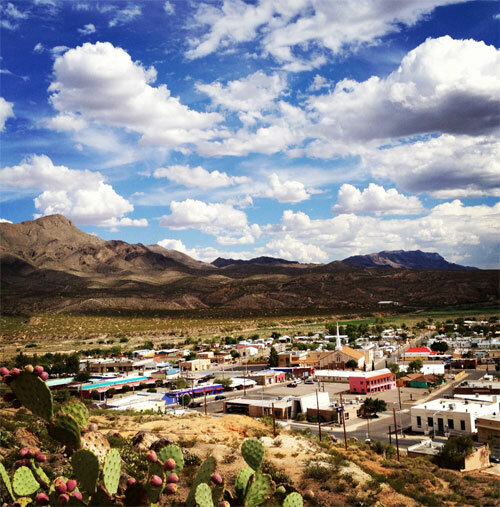 Situated off I-25 between Albuquerque and Las Cruces, this little town got its big name in 1950 as part of a publicity scheme to celebrate the 10th anniversary of Ralph Edwards’ hugely successful game show on NBC radio. (more info on the name change) Once Hot Springs became Truth or Consequences, Edwards traveled to town annually, celebrity friends in tow, for nearly 50 years to celebrate “Truth or Consequences Fiesta.” Edwards has been gone for some time now, but Fiesta continues to this day. Las Palomas Plaza (pictured at left), completed by the artist Shel Neymark circa 2003, is an inviting feature of downtown T or C. Located next door to the artifact-studded Geronimo Springs Museum and across the street from the Post Office, the fountain provides a place for visitors to sit and relax while soaking their feet in the town’s famous hot mineral waters. Currently, the water cycles at 15 minutes on / 15 minutes off – these waters are worth waiting for if you can spare the time. 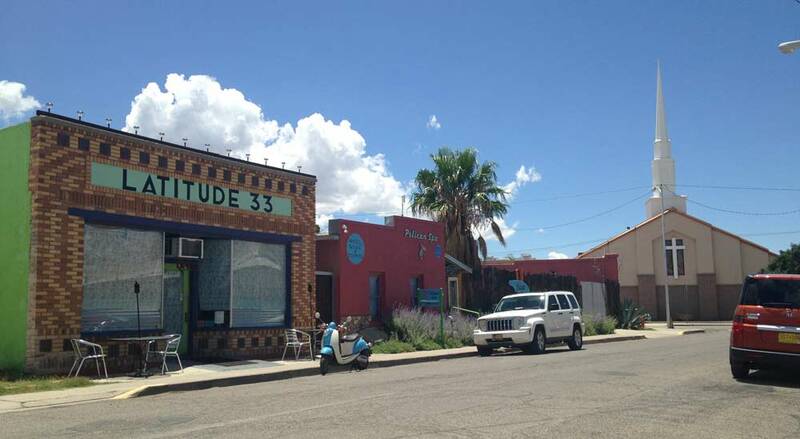 MainStreet Truth or Consequences, a community-based group dedicated to the revitalization and beautification of the downtown, partners with the Sierra County Tourism Board in the promotion of downtown Truth or Consequences, its Historic Hot Springs District and water sports on the Rio Grande. MainStreet is also the group behind the monthly Second Saturday Art Hop, a night when many downtown businesses open their doors from 6-9pm. The Geronimo Trail National Scenic Byway Visitor Center is also open daily, just inside the entrance of the Lee Belle Johnson. Brochures, maps and other information on local and area attractions and amenities are available there 7 days per week. There are TEN commercial bathhouses offering hot springs in the cool town’s easily walkable historic hot springs & commercial district. The bathhouses were the town’s biggest draw in the Hot Springs era, back when T or C was advertised as the City of Health. Today, the springs are experiencing a resurgence in popularity. Most of T or C’s spas have been charmingly restored and are open to walk-ins who can pay to soak by the hour. Several also offer lodging. Want to read about goings-on in T or C? Check out the Truth or Consequences category in our blog. Information for the municipality can be found on the City of Truth or Consequences website, torcnm.org.